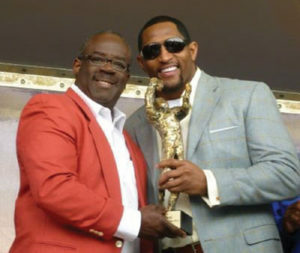 Broward County Artist George Gadson and Baltimore Ravens’ Retired Linebacker Ray Lewis meet again.SOUTH FLORIDA – Through some shared history and much mutual respect, artist George Gadson has been invited to design and present a sculpture to Baltimore Raven’s retired Linebacker and Pro Football Hall of Famer Ray Lewis, on Saturday, August 25th at 2 p.m. at Kathleen High School, 1100 Red Devil Way, Lakeland, Fla. The event is open and free to the public and includes a special invitation to hear Lewis speak after recently accepting the honorable induction into the Pro Football Hall of Fame this past August 4th in Canton, Ohio, making him the first person in Polk County, Fla, ever to receive this honor. Both Gadson and Lewis hail from Polk County, Fla.; Gadson from Fort Meade, and Lewis from Lakeland, not more than 20 miles apart, at a time when segregation was the norm, and success stories out of small towns in Central Florida, not the norm. No stranger to football royalty, Gadson has been designing for highly-profiled persons in sports and politics since as far back as the 90s. This was a repeat honor and invitation for Gadson from the South Florida Superbowl Host Committee, as in 1995 and 1999 he created two South Florida Super Bowl bronze commemorative sculptures aptly named, “The Quarterback” and the “The Kicker,” for each of the NFL Team owners as well as other significant VIPs. In 2008 he went to the White House with his mum, Annie-Lou Gadson, under George and Laura Bush’s Administration to present a hand-crafted Christmas ornament for the White House tree. Gadson, who believes that art plays a significant role in providing a quality of life and vitality to the community in which he serves is a self-taught artist and Duke University graduate. A Florida native, he has gained world-wide recognition for his realistic portraits and sculptures of individuals and figures that have historical significance. His work is displayed throughout Broward County in many venues for Public Art. Working in a variety of mediums he has created bronze relief portrait sculptures of Jim Moran, Moran Foundation and Founder Bill Darden for Darden Restaurants, Inc. owners of Olive Garden and Red Lobster. His works are permanently displayed in the International Swimming Hall of Fame, the African American Research Library and Cultural Center, the City of Lauderhill, the City of Tamarac, the City of Pompano Beach, to name a few of the significant locations around the county. His work can also be seen throughout South Florida in Miami-Dade and Palm Beach Counties, and nationally in private collections of Harry Belafonte; and one of his significant sculptures is part of Venus Williams’ artwork collection, given as an award to Williams by the City of Lauderhill. Ray Lewis holds a 17-year professional career for the Baltimore Ravens of the National Football League (NFL) and prior played college football for the University of Miami. Drafted by the Ravens in the first round of the 1996 NFL Draft, upon his retirement following the 2012 season, Lewis became the last remaining active player from the team’s inaugural season. He played middle linebacker his entire career and is considered by many to be one of the greatest ever to play the position. As a 13-time Pro Bowler, a 10-time All-Pro, and one of the few players in NFL history to play in a Pro Bowl in three different decades (1990s, 2000s, and 2010s). For further information on this event or on the Broward County Artist George Gadson, contact the artist himself at (954) 822-5425; email: Georgegadson@gmail.com; and email Samantha Rojas, with Swan Communications, INC at Swancomm13@gmail.com.